Starting GPS Co-ordinates: N51 14' 29.08" W000 40' 55.92"
Finishing GPS Co-ordinates: N51 14' 17.91" W000 41' 17.59"
Beech Lane forms a 'c' shape with Green Lane, very similar in form to the astrological constellation Gemini! A short, if very pleasing drive through Highfield Copse and Week Wood. It is a little tight with regards to undergrowth in places, especially where the holly has grown too vigorously. The paintwork will squeal and complain, but it is never so tight as to present a problem. The going is firm too, and it is almost completely unrutted. Beech Lane starts life as a metalled country lane just south of the railway in Flexford. The tarmac soon ends, and the lane wends its way through the lovely woodland of Highfield Copse. After around one kilometre, the lane turns hard south, continues for another 250m in that direction, and then joins Green Lane from the north. To make a good go of it, it's best to combine driving the two lanes, as individually they are too short to make it them worth driving separately. 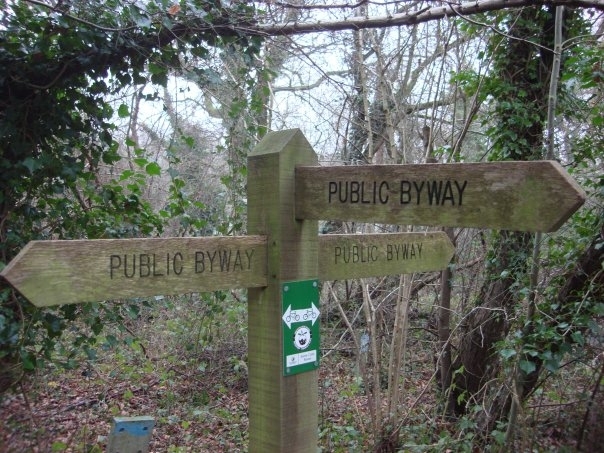 At the junction between the two lanes, the best signpost ever can be found (see picture above left). If only life was always that awesome!